The many moods of the seasons can understandably leave our lips a little worse for wears. To add to the problem, lips tend to dry out fast due to the lack of sweat glands in the area. So whether you’re experiencing some tightness and dryness or everything feels fine but you’re noticing flakes appearing, a good gentle lip scrub can help rejuvenate the cell reproduction cycle, leaving a much smoother and healthier look and feel. An important step to good lip care, is skipping the harsh and unnecessary chemicals in mainstream lip products. It’ll be easier on your skin, and your wallet. Remember that the lips are protected solely by the most sensitive skin in our entire body, so that’s not a great defense against the elements. Sensitive care, regular hydration and the occasional exfoliation is all you really need to ensure they’re well taken care of and pucker-ready. The following recipes serve as a dual-purpose treatment: an exfoliator and a nourishing agent (the perfect combination)! Be advised: You might feel tempted to eat some of these delicious homemade scrubs, but try to restrain yourself. In a medium sized bowl mix all ingredients together until well combined. Transfer mixture to an airtight container and store in a cool dry place. For use, spoon out a dime sized amount and rub very gently on lips for 15 seconds. Rinse lip scrub off with warm water and a washcloth. 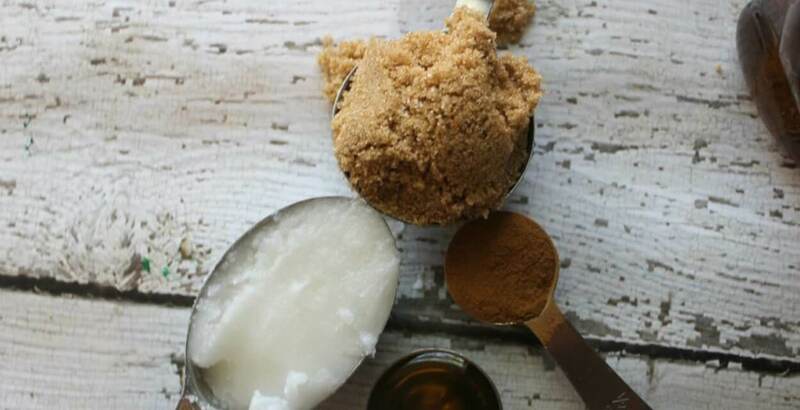 Apply a natural balm to lips or use an oil such as coconut or sweet almond. Hey presto! You’re good to go. If you have an allergy to coconut oil used in any of these recipes, you can successfully replace it with cocoa butter or shea butter. For lip scrub containers, you can use anything you want, but we like these multi-coloured cosmetic jars. 1 tsp. cinnamon powder. You can even try ginger powder, nutmeg, or cloves. This one is rather fancy, and the ingredients add up to be rather pricey. However, we’ve kept this in the list not only because it’s so dang delicious, but because it makes for such a great gift for friends, family, at weddings, christmas, parties or other fancy celebratory ceremonies! One batch can create a gift for many, so it does work itself out price-wise. This recipe also has a different method than the others, so be sure to read thoroughly before starting! You can find all the ingredients here. Combine the beeswax, shea butter and liquid oils in a microwave safe container and heat until the beeswax has completely melted (doing 30 second increments in the microwave). Once all of the oils are in liquid form, stir in your flavouring oil of choice and sweetener. Mix well. Stir in 2.5 ounces of white sugar pour into your lip butter pots and let the mixture harden.